Geomodeling actively supports Universities and Consortia that have applications for our software. Three very interesting graduate student thesis projects have been completed over the past two years involving use of SBED to investigate problems in permeability modeling of heterogeneous reservoirs. “Estimation of geocell permeability based on small-scale sedimentary structures in the Brent Group on the Gullfaks and Oseberg fields” by Camilla Frafjord at the University of Bergen focused on improving permeability computations as a function of small-scale sedimentary structures (centimeter- to meter scale). The project was funded by Statoil and used SBED to model small-scale sedimentary structures in the Gullfaks and Oseberg fields, where Statoil recently has made updated reservoir models for the Brent Group reservoirs. The project was goal to suggest improvements in permeability modelling for these fields . In a related thesis by Ingrid Dalland, “Estimation of geocell water saturation based on small-scale structures in the Brent Group on the Oseberg and Gullfaks fields,” data from cores and core plugs from selected intervals were used to model extensive small-scale structures in SBED to suggest improvements to the water saturation modelling. 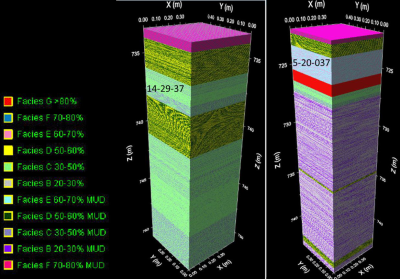 This interdisciplinary thesis included elements from sedimentological description, petrophysical measurements and reservoir technical considerations. Mahbub Alam from the University of Calgary performed a case study entitled, “Estimation of Reservoir Heterogeneity from the Depositional Environment in Reservoir Characterization of a CHOPS Field.” Using SBED’s near-wellbore modeling capabilities, Mahbub was able to develop realistic production estimates targeted at improving enhanced oil recovery (EOR) processes in oil sands. By considering the impact of small-scale geological details, this method addressed the inherent errors in reservoir predictions that are a consequence of ignoring reservoir heterogeneity at the lamina scale.